Donated by: Phil Hocking, Laubman and Pank, South Australia. 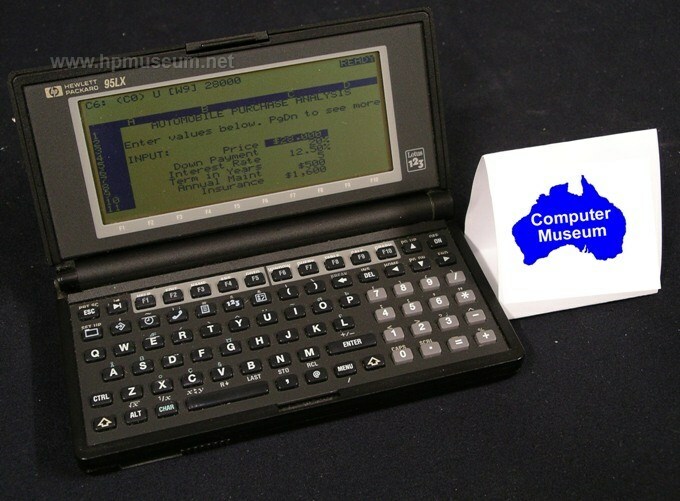 The 95LX was the first in a series of handheld, "PDA-like" business computers. It came standard with ROM-based MS-DOS 3.22 and Lotus 1-2-3. Other built-in software included: Appointment Book, Phone Book, Memo Editor, Filer and HP Financial Calculator. The 95LX was powered by two AA batteries. For communications, it featured an infrared transmitter/receiver and a serial interface with built-in terminal emulation software. The 95LX also came with a PCMCIA slot. 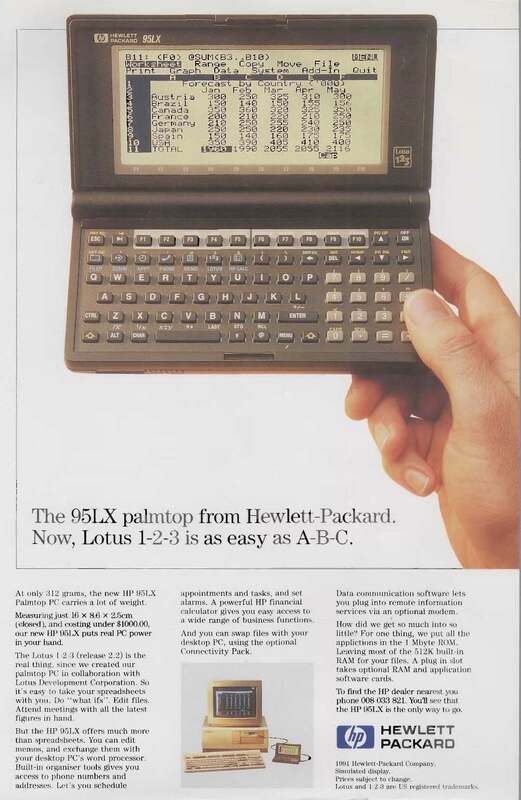 The standard unit came with 512KB RAM. A 1MB unit was available for an additional $250 (P/N F1010A). Click here to see the 95LX in an article on the Silicon Valley TV program "Computer Chronicles" in 1991. (1 minute 32 seconds, 6.9MB). To learn everything you ever wanted to know about the 95LX/100LX/200LX, visit our collection of the outstanding publication Palmtop Paper. Be sure to read about the history of Portable Navigator. This marine navigation system was written by former HP employee Graham Collins and ran on HP palmtops (and earlier machines). As of 2014, there is still an active commercial market for 95/100/200LX palmtops (products, accessories and repairs). The worldwide leader in the market is Thaddeus Computing. Software and manuals for the 95LX can be found here. AS of 2013, the 95LX, 100LX and 200LX are all still very common and still very reliable. It is very handy that these palmtops can be run from regular AA batteries. Over 95 percent of the units we see are in fully functioning condition.